A seasonal spin on the classic moscow mule. I used to be a bartender for a catering company so I’m surprised that this is my first official adult bubbly post. But to be honest, I’m not much of a drinker. I would rather eat my calories than drink them if you know what I’m saying! When I do drink, it’s usually at social gatherings. So, with the holidays in full swing, here is my all-time favorite holiday drink! To take your moscow mule to a seasonal level, you can add natural fruit juices like pomegranate, cherry, and cranberry. These fruits are great for your health and would be a great healthy addition to your beverage. I’ve been loving the holiday mule with cherry juice as cherries are great for exercise recovery and muscle soreness. During the holiday season where there is a higher risk of cold and flu, cherry juice can strengthen your immune system. If you are hosting a Christmas party, your guests can choose what fruit juice they prefer and you can simply combine all ingredients into your copper mug and stir -- no need for a cocktail shaker, although you may feel fancier using one! This cocktail is super easy and can be very festive with garnishes like pomegranate arils, frozen cranberries, rosemary sprigs, orange slices, and lime wedges. 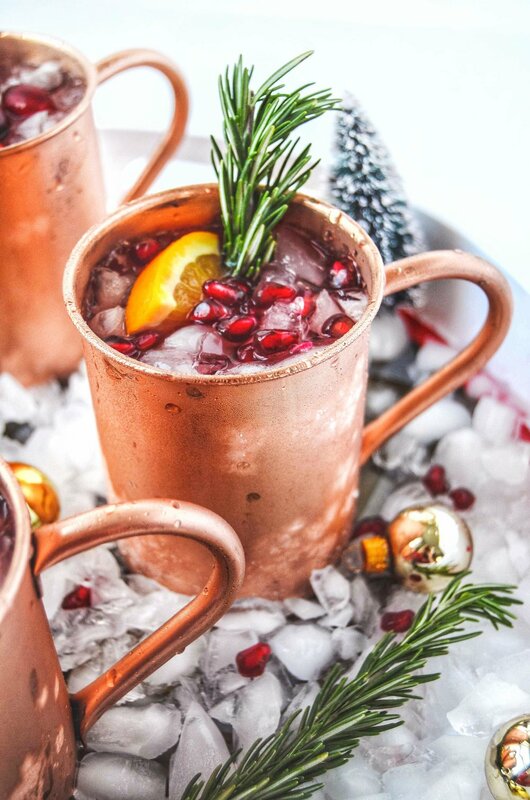 The Holiday Mule - A seasonal spin on the classic moscow mule. Fill your copper mug with crushed ice. Measure 2 oz of vodka, and pour into mug. Squeeze up to half of lime and ⅓ cup of preferred fruit juice into mug. Top off with ginger beer until full and stir.